Phonec 2's interface is said to "strike a balance between form and function". Great art can be inspired by many different things - people, places, books, paintings etc - but we dare say that Psychic Modulation's Phonec was the first soft synth to be born out of a love of "the mystique of video logos you hear at the beginning of worn out VHS tapes". We're not sure we even quite know what that means, but now we have version 2, which runs on Mac and PC in 32/64-bit VST/AU formats and offers all the features of the original plus a few more besides. 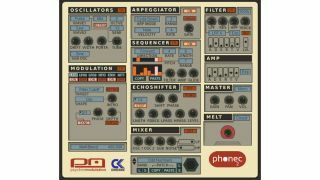 We're told that Phonec 2 specialises in "vintage analogue tones, lo-fi synthscapes, ethereal pads, minimal techno sequences and synthwave leads and basses". A spec list is below, and you can find out more, download a demo and buy Phonec 2 for $59 on the Psychic Modulation website.